So it has hardly peaked above -4°C this entire fashion week, which well, is a bit of a bummer. However having persevered with this ferociously bitter New York winter for a few months now, I have developed my skills in layering down to an absolute fine art. Noone would ever know I had long johns and thermals ontop of my cashmere undies under every single outfit. Oh wait you do now. Rather than step out in shorts and a big ol' fur (like yesterday's outfit - click here) I opted for a slightly more conservative ensemble channelling a combination of Catwoman and Bob Dylan (who knew they were such a complementary pair). What I'm Wearing: SUPERCALAFASHIONISTIC Beanie, Zara Sweater, Versace for H&M Leather Jacket, Aritzia Leather Trousers, La Redoute Clutch & Topshop Boots (& gold socks). New York style has rubbed off on my somewhat, head to toe black seems to be an option I return to on far too a regular basis. 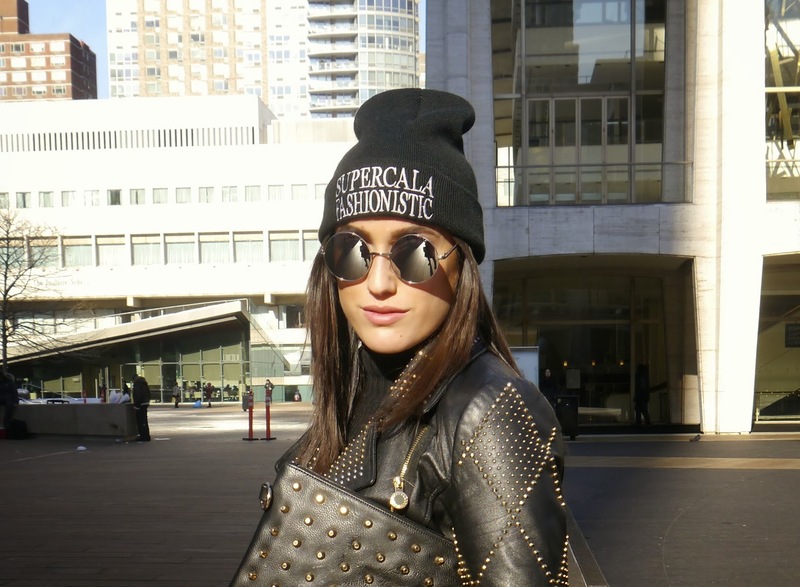 Despite this and donning enough golden studs to set off a dozen metal detectors I head back off to the Lincoln Centre for the Rebecca Minkoff Fall 2014 show. Bumping into my total best friend, yeah I'm kidding, Chiara from The Blonde Salad who is one of the sweetest people ever (click here to view our last event together in NYC) was another great highlight of Fashion Week so far. Together we shivered side by side for another snap together which I posted to Instagram (@georgiabenj) faster than you can say 'cheese'. And how snazzy is the Mercedes-Benz Fashion Week insta-wall. Packed full of the latest insta-pics with #mbfw tagged to the photo, hidden away inside the Lincoln Centre show space. Lets not forget to mention the fashion scanner. Rather than physical invites which are of course pretty damn cool, at NYFW you scan the barcode that comes with your email invite and it prints out a little ticket for you with your seat allocation. Gah technology these days. Looking forward to another busy day tomorrow, fingers crossed the snow holds off! Love the leather look! You looked flawless. Great outfit! That jacket is stunning.